Dental bridges serve the same purpose as any other bridge, and literally "bridge" the gap created by one or more missing teeth. Missing teeth can cause problems with speech and eating, as well as creating a lack of confidence. Missing teeth can also cause your surrounding teeth to move, which may change your bite or make your jaw sore. Tilted teeth create new places for dental plaque to hide, increasing your chances of needing a filling or gum disease treatment in the future. Dental implants are often used to support dental bridges. Bridge case by Chris Mercier. Dental bridges serve an aesthetic purpose too, and allow you to show off your beautiful smile without shame or fear that your missing tooth is what people will remember you for. Because dental bridges cost less than other methods of tooth replacement, they also help your wallet, too. This is the most common type of dental bridge, and is traditionally made of porcelain fused to metal, although newer metal free materials can be used for a more cosmetic appearance. The cantilever dental bridge supports the replacement tooth from just one side. It is most often used when supporting teeth are located on only one side of the missing tooth or in areas of the mouth that are under less stress. Also known as a resin-bonded bridge, this type of dental bridge is generally only used in the front of the mouth where the biting force are less severe. It consists of a false tooth fused to metal bands or hard ceramic materials and is bonded to the supporting tooth with resin. Dental bridge work requires a minimum of two dental visits to complete. During the first visit, we will need to file down the supporting teeth so that the dental crowns will fit over each tooth leaving enough room in between for the replacement tooth. The second step in the dental bridge procedure is for us to take an impression, which provides a laboratory with an exact customised mould to use when creating your bridge. 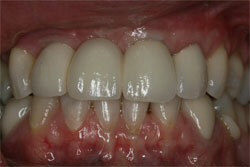 We will then make a temporary bridge to protect the exposed teeth and gums while the permanent version is being made. To complete the dental bridge procedure, you'll need to return for a second appointment. This time we will remove your temporary bridge and the new permanent bridge will be tried in place. Placement usually involves some small adjustments to get the fit just right. A dental bridge can last for more than 10 years, especially if you practice good oral hygiene. It's essential to remember that dental bridge work requires healthy surrounding teeth and gums to stay in place, so you need to brush twice a day and floss daily. Regular dental visits and dental cleanings are recommended twice a year. Contact us on 0151 709 7948 today to find out how to get your dental bridges and crowns in Liverpool.